In Scotland last weekend to take various co-op photos (although really Scotland won’t feature a great deal in the co-op architecture book) as well as looking round the Verdant Works in Dundee. 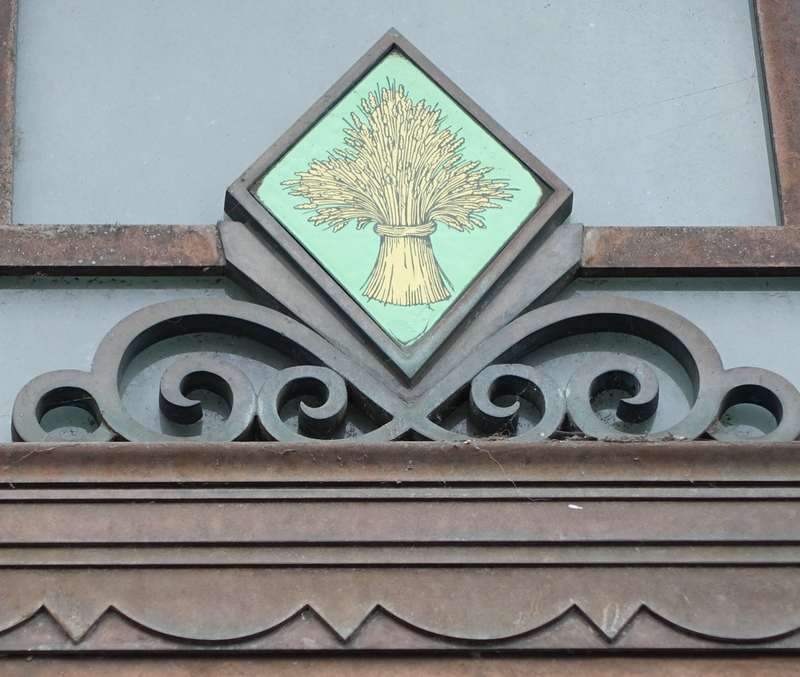 So here is doubtless one of very many wheatsheaves which I expect to see over the next few years, this one indicating the lovely art deco former co-op bakery at Stonehaven, near Aberdeen. Not sure if this is ceramic tile or enamel, probably the former. Similar signs show a cow or bull’s head, a basket of grocery and a pestle and mortar. The little row of shops connects with the even more wonderfully art deco Carron Restaurant to the rear, originally opened by the local co-op in 1937 and now functioning again (privately) after restoration. 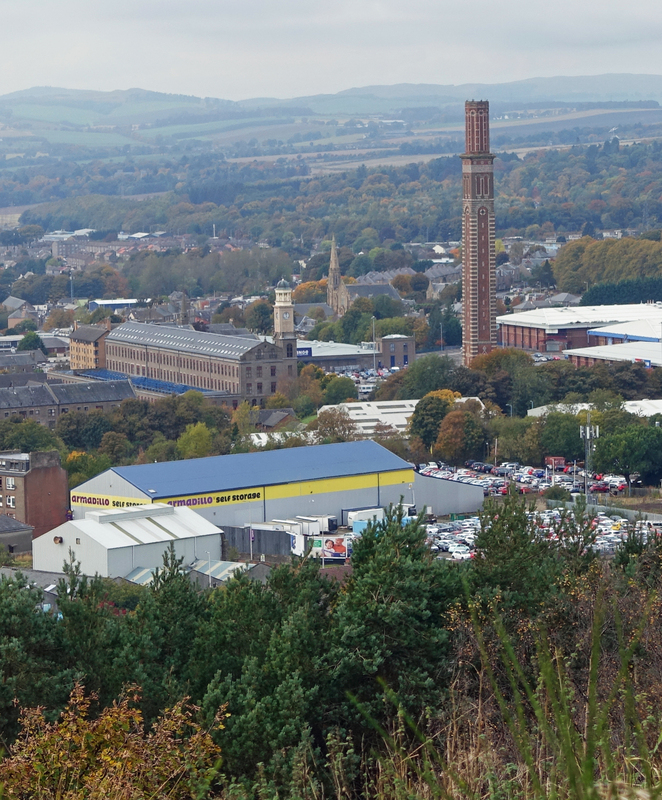 The second photo relates to my last book on industrial architecture, and shows the huge Cox’s Stack at Dundee’s Camperdown Works (jute of course) seen from above at the Law, a volcanic plug which looks down over the city. Quite a treat to see the chimney from above after staring up at it when trying to fit it into a photo from ground level. Liverpool next for more photos. Back from the Association for Industrial Archaeology conference on the University of Sussex campus at Falmer, now just across the roaring A27 from the Brighton & Hove Albion ground. The sun shone, the Downs looked tempting – so here’s a photo of the University’s boiler house! The campus, designed by Basil Spence over a period of years, is fascinating. Two stand-out buildings are Falmer House, all arches and views through, and the Meeting House, a spectacular white concrete (I think) circular-ish building with masses of panes of coloured glass lighting the upper chapel. 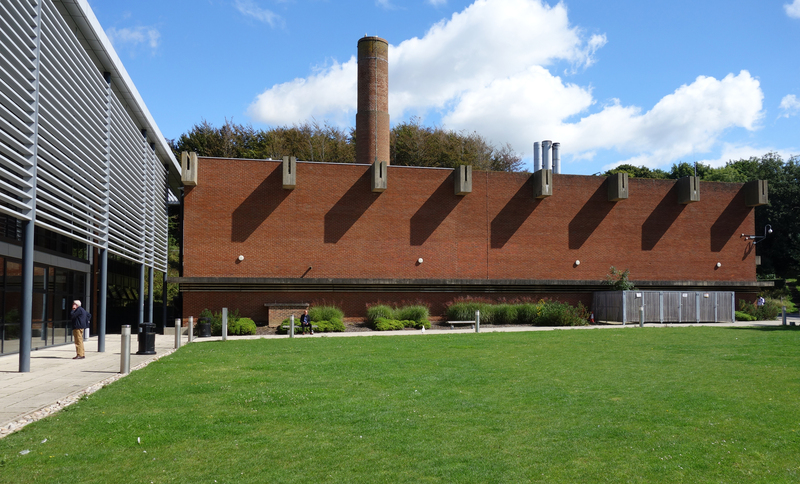 The rather less noticed boiler house is also a real success, an industrial take on the themes running through the campus, and reminiscent of Tate Modern in its brickwork. I hope the prospective students and their parents packing the campus for open day last Saturday enjoyed it as much as I did. Thanks to all the conference organisers, and whoever arranged the barrel of Harveys Best in the bar! 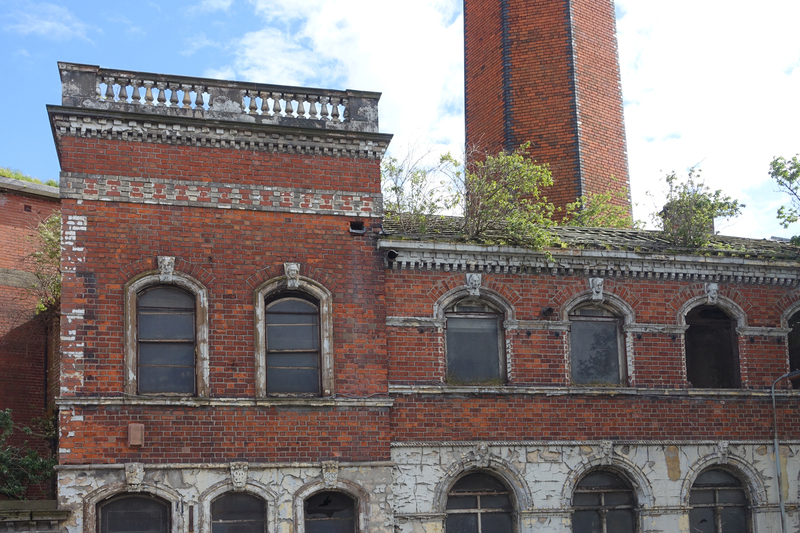 This is Jennymount Mill in north Belfast, or rather a small portion of it, the offices built in 1864 and the chimney behind, which I guess must be about 140 feet high (that’s about 43 metres). The linen mill itself is a complex collection of structures, but the main one is a very handsome tall block of 1891 by the architect John Lanyon. It has lovely bright red brickwork, with the round(-ish) headed windows set back in deep architraves, which broaden out – the brick courses step back – as they near the top of the window; a curious and pleasing effect. Since I was there the day following Belfast’s worst ever June storm, which was still passing through, didn’t have long to look at the gentlemen’s head keystones looking back at me from the old office. It seems they are famous names including Wordsworth, Columbus and Newton; not sure what they’ve ever done for the linen industry but one gets the idea of reflected glory. Belfast was enjoyable but windy; the scale of the structures around the docks is huge, particularly the graving dock where Titanic was fitted out. Having been at Hilden, near Lisburn, to see another mill the previous morning, only fitting I should have a pint of Hilden Brewery beer in the evening, so I chose Barney’s Brew, a wheat beer named after Bernard Hughes who built an enormous flour mill in Belfast. Excellent. And the tallest chimney is? Seems, initially, an easy question to answer: which is the tallest surviving 19C industrial chimney in the country? OK, so which country, and mills or chemical works, and brick/stone, and circular/octagonal/square cross-section; so many combinations. We could have the tallest brick octagonal mill chimney in England – so that’s the one at Shaddon Mill (1836) in Carlisle, now 270ft but originally 305ft. At first this was not the tallest in England when built, as is often quoted, although it did become such (if you see what I mean) when the Adams soap works chimney (1836) in Smethwick was truncated. As for the ultimate tallest in England, that’s the chimney at India Mills (1867) in Darwen, a polychromatic brick square cross-section monster of 289ft (11ft reduced from its original height). This just beats, by 6ft2in, the sublime Cox’s Stack (1865) at the Camperdown Works in Dundee, which remains just as it was built. Curious that the real mega-chimneys at Glasgow chemical plants, Tennant’s Stalk (1842, 435ft6in) at St Rollox and Townsend’s at Port Dundas (1859, 454ft), both brick with circular cross-section, have gone but the more decorative polychromatic stacks remain. But I’m still delving into the world of chimneys, so don’t take all this as the last word! 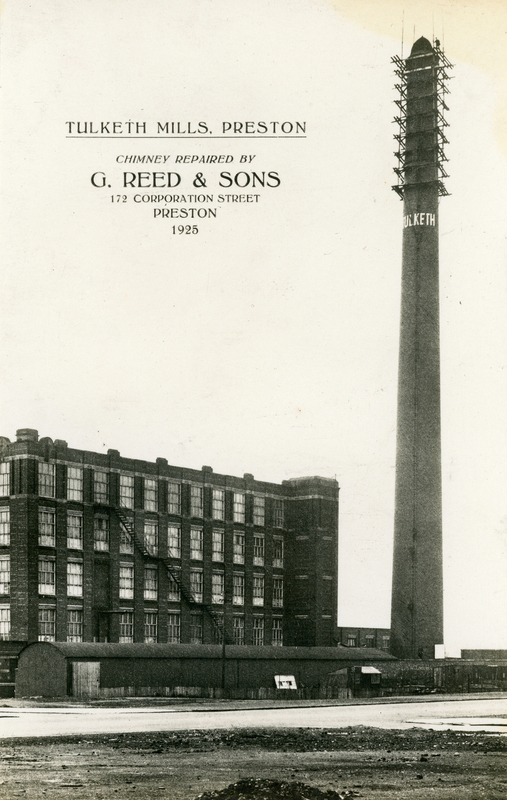 The pic is of Tulketh Mill (1905) in Preston, with its brick chimney (231ft, now reduced to 180ft) used to advertise a firm of steeplejacks. By the way, if you are wondering about the lack of metric measurement, they were built in feet, so they stay that way for the moment. Hope to see the Darwen stack for myself soonish. Happy New Year everyone.